The disposal of RM remains a major problem. Reports on this issue in the open literature seem scarce. Below you can find some general information about the disposal of Red Mud as well as the common practice in the USA, India, China, Japan, Spain, France and Greece. In a research by Hind et al. in 1999, it is reported that conventional disposal methods have revolved around the construction of clay-lined dams or dykes, into which the RM slurry is simply pumped and allowed to dry naturally. The design and construction of such residue impoundments has varied considerably over the years [B. Salopek, J. Strazisar, 1993], with disposal practices generally dependent upon the nature of the immediate environment. The authors, note that the operation of these conventional disposal areas was simple and inexpensive, however the potential impact on the surrounding groundwater and environment, and difficulties associated with surface rehabilitation, forced significant changes in disposal practices [D.J. Cooling, D.J. Glenister, 1992]. This led to the construction of doubly sealed impoundments, incorporating a polymeric membrane as well as clay lining, and drained lakes, having a drainage network incorporated in the lining material, have subsequently seen widespread use. Drained disposal systems have been found to reduce the threat of the residue to the environment, while also increasing storage capacity as a result of better residue consolidation [L.K. Hudson, 1982]. As an alternative, dry disposal of bauxite residue, involving enhanced dewatering and evaporative drying, has also been found to further decrease environmental risks and lower overall disposal costs [D.J. Cooling, D.J. Glenister, 1992]. In another report by Agrawal et al., it is reported that out of 84 alumina plants all over the world, only seven are still practising the sea disposal in a planned manner because of scarcity of land. One patent on the disposal of RM has been also granted to W. M. Gerald. The title of the patent is “Treatment and disposal of red mud generated in the Bayer Process”, AU701874. The inventors propose a process that produces a RM cake low in caustic and alumina concentration permitting environmentally friendly disposal. Quite recently, the Virotec International Ltd. (Australia), announcened a treatment process for RM that renders the material safe for a variety of applications. The method is based on the use of seawater, which allows the conversion of “soluble alkalinity” (above all from sodium hydroxide) into low soluble minerals (essentially Ca and Mg hydroxides, carbonates and hydrocarbonates). The pH of RM is also reduced and can be decreased down to pH < 9. This technology is patented and several products with the name Bauxsol™ are available. A study on the environmental behaviour of RM processed with the above technology is also available [C. Brunori et al., 2004]. More information on the patented treatment, can be found elsewhere [H. Genc¸-Fuhrman et al, 2003, H. Genc¸-Fuhrman et al, 2004, H. Genc¸-Fuhrman et al, 2004] and the web site of Virotec. The following text is part of a report issued by the EPA in 1990, under the title: “Report to Congress on Special Wastes From Mineral Processing”. For more information and the original full text, please follow the link. Source: A. Agrawal, K.K. Sahu, B.D. Pandey, Solid waste management in non-ferrous industries in India, Resources, Conservation and Recycling 42 (2004) 99–120). Reprinted with permission from Elsevier. Below, on the left you can see a picture from a red mud disposal lake in the vicinity of Kashipur region of Orissa, India. Please follow the link and get informed about the people of Kashipur. On the right, you see a landfill where dry disposal has been taking place. The area is regurarly sprayed with water to reduce dust problems. The following pictures have been in the following web site: http://www.ir.msisa.ru/english/rd/projects/romelt.htm. In left picture, the pond of NALCO factory in Damandjodi (India) is presented. The slurry has a composition of 45% liquid and 55% solids. 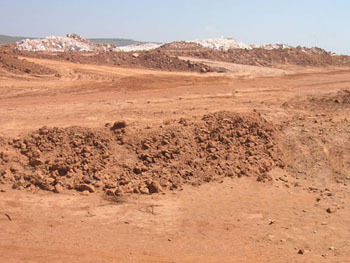 Output of Red Mud is 200 t/hour (solids). In the right picture, we see an overview of the 212 hectares pond. There is about 20 million tons of waste products accumulated. In Japan, majority of RM is deposited into the ocean after neutralization [J. Hyuna et al., 2004]. However, J. Hyuna et al also reports that aluminum manufacturing companies in Japan have developed pretreatment techniques for bauxite before the Bayer process to reduce the amount of RM discharged (Japan Patent No. Heisei 6-340934, 1994 and Japan Patent No. Heisei 7-47301, 1995). We have limited information. The practise used to be sea disposal, at least in some cases, but we speculate that this has changed in view of the new European legislation. The following two pictures present disposal ponds. The pictures have been found in the pdf file “La Bauxaline”, issued by (former) Pechiney for the plant in Gardanne. This disposal method is referred as “lagooning” in the text. There is only one alumina industry in Greece. The situation concerning the disposal method is changing. 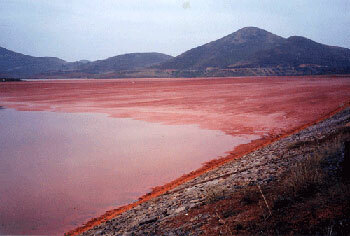 Up to now (2006) Red Mud, is discharged through a pipe line at the sea of Antikyra Bay. A new project, involving high pressure filtering and dry disposal and reuse of Red Mud, is under implementation. Information on some aspects of the up to now practised disposal of Red Mud is available at the works of S.P. Varnavas, P.P. Achilleopoulos, 1995 and S.E. Poulos et al., 1996. For information on the new adopted solution, please go to News (date 25/04/2006). Source: S.E. Poulos, M.B. Collins, C. Pattiaratchi, A. Cramp, W. Gull, M. Tsimplis, G. Papatheodorou, Oceanography and sedimentation in the semi-enclosed, deep-water Gulf of Corinth (Greece), Marine Geology, 134, (1996), 213-235. Reprinted with permission from Elsevier. Below, you can see (left) the High Pressure Filter Press installation and (right) the dry Red Mud, now called “Ferroalumina”. A. R. Hind, S. K. Bhargava, Stephen C. Grocott, “The surface chemistry of Bayer process solids: a review”, Colloids and Surfaces A : Physicochem. Eng. Aspects, 146 (1999) 359–374. B. Salopek, J. Strazisar. 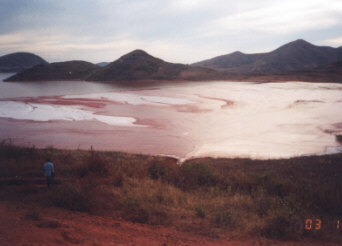 The influence of red mud impoundments on the environment. Light Metals (Warrendale, PA, United States) (1993), 41-4. D.J., Cooling, D.J. Glenister, Practical aspects of dry residue disposal Light Metals 1992, 25-31, Proceedings of the 121st TMS Annual Meeting, Mar 1-5 1992, San Diego, CA, USA, Published by Minerals, Metals & Materials Soc (TMS). L.K. Hudson, Alumina Production, The Aluminium Company of America, Pennsylvania, 1982. A. Agrawal, K.K. Sahu, B.D. Pandey, Solid waste management in non-ferrous industries in India, Resources, Conservation and Recycling 42 (2004) 99–120. 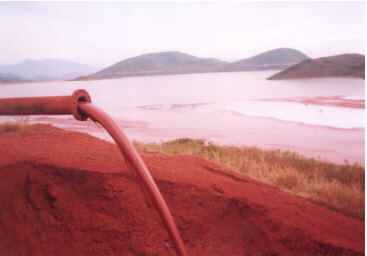 W. M. Gerald, Treatment and disposal of red mud generated in the Bayer Process, AU701874. P. M. Prasad, H. K. Chandwani, H. Mahadevan. Disposal practices for bauxite tailings at the alumina refineries. Transactions of the Indian Institute of Metals (1996), 49(6), 817-839. For a more extended bibliography on the disposal of Red Mud please refer to Bibliography. Text written by Y. Pontikes. Reflects only personal opinions. Last updated April 22, 2006.